An 11-year-old boy went missing on Thursday evening after being scolded by his father, and was found by police at the other end of the city after six hours. An 11-year-old boy who went missing on Thursday evening was found by police after six hours, just before typhoon Jongdari hit Shanghai. Police in Yichuan area of Putuo District received a report from the boy’s parents about 6pm on Thursday that their son went missing after being told off by his father earlier the same day. The boy was last seen on surveillance camera at the Zhongshan Road N. Metro station. He took a train in the direction of Xinzhuang at 5:30pm. The boy's parents mentioned that his grandma lives in Jinshan District, so police supposed that he could be heading there. Police in all Shanghai districts were informed to look out for the boy. 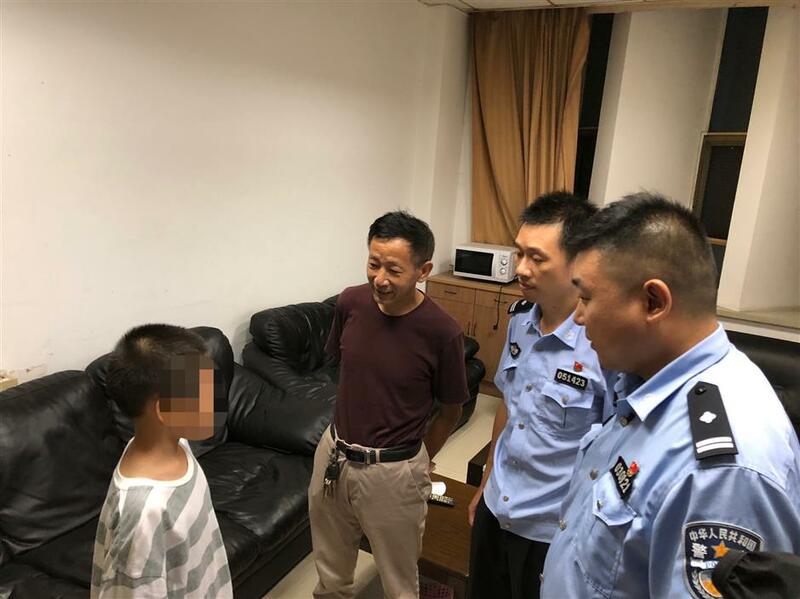 At 11:10pm, officers at Langxia Police Station in Jinshan District reported that the boy was brought to them by a taxi driver. The boy's uncle (second from left) goes to Jinshan District to take the boy home after police located him. The boy was reunited with his parents at 3am Friday morning, police said.